! 15 JANUARY 2017 ! Proposals should be submitted against one of the symposium themes. Depending on the theme, either a long paper, discussion of a number of dimensions, or a short paper focussing on a particular issue is invited. Proposals for long papers should be 1200-2000 words. Proposals for short papers should be 300-600 words. When submitting a proposal the author should choose the session corresponding to the theme for which the abstract is intended. 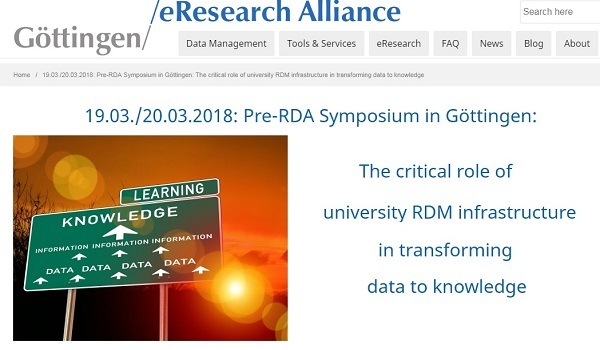 All over the world universities and libraries have started the task of developing Research Data Management (RDM) services. Developments of repository infrastructures for the storage of data. - - - See, for example, EUDAT: Research data infrastructure and European Open Science Cloud vision. Support in publishing data & assignment of persistent identifiers (PIDs). - - - See, for example, DSpace-GLAM based on DSpace-CRIS : Manage, Analyze & Preserve your digital heritage. RDM services are often seen as requiring a JOINT EFFORT from university, library, IT center, faculties and other stakeholders. Nevertheless, currently - - nowhere in the world - - such a complete support scenario has been established. This means that it is timely for actors in the various dimensions of such initiatives internationally to share their experiences, research and insights. The upcoming Symposium in Göttingenin will explore this topic and hear lightening talks from research organisations that have started to offer such services in whole or in part on their campus. Thus, the Symposium will provide a forum for universities and libraries to share their experience and to learn from each other.